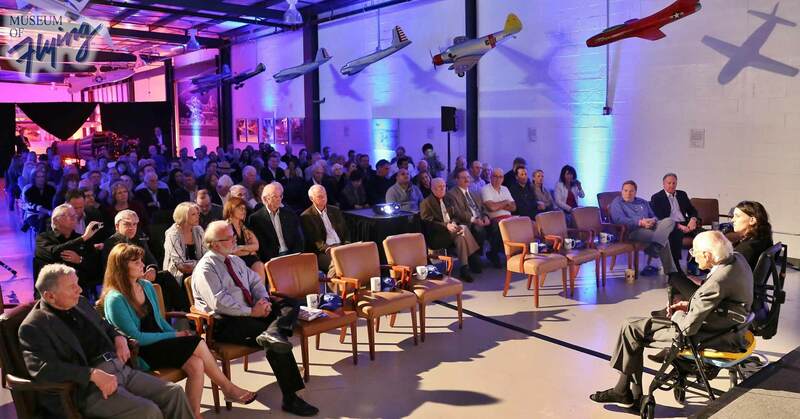 On Friday, February 20th, 2015, the Museum of Flying held our kick-off event for the Aviation Film Festival series. The film that debuted was “Flying the Feathered Edge, the Bob Hoover Project”. The film was directed by Kim Furst and features Harrison Ford, Carroll Shelby, noted air show performer Sean Tucker and a host of other notable aviators. Known as the “pilot’s pilot”, Mr. Bob Hoover was present for the event. Mr. Hoover was a World War II Fighter Pilot, and later a test pilot with both the United States Air Force, and North American Aviation. A legendary air show performer, Mr. Hoover has entertained more air show attendees than any other air show performer in the world. There was a line of autograph seekers that seemed to never end prior to the screening. Mr. Hoover was singing his book, “Forever Flying”, the DVD of the movie and the movie poster, all of which were on sale during the reception. More than 200 guests were in attendance for the event that served as a small fundraising event for the Museum. Prior to the screening, Mr. Hoover and Director, Kim Furst held a brief Q&A session and also a “making of” segment. Mr. Hoover was very entertaining and we believe that the event was a very special evening for all in attendance.